Matéria sobre infanticídio e a Atini, da rede norte-americana ABC News (23/09), tenta mudar o foco do assunto principal – na tentativa de desacreditar a luta pelo direito à vida das crianças indígenas e fazer acusações, sem fundamento e de caráter pessoal, a integrantes da organização. Mas dezenas de leitores têm comentado a matéria, expressando sua opinião e apoiando o movimento pela vida. Leia aqui a materia original. Evangelical Christian missionaries have launched a campaign against what they claim is the widespread practice of infanticide among Amazonian Indians. The missionaries, associated with the U.S.-based group Youth With a Mission, say the Brazilian government is turning a blind eye to the killing of babies born with birth defects, many of which are treatable by Western medicine. Brazilian government officials say the missionaries are exaggerating and exploiting the issue to justify their attempts to convert Indians to Christianity, destroying ancient civilizations in the process. 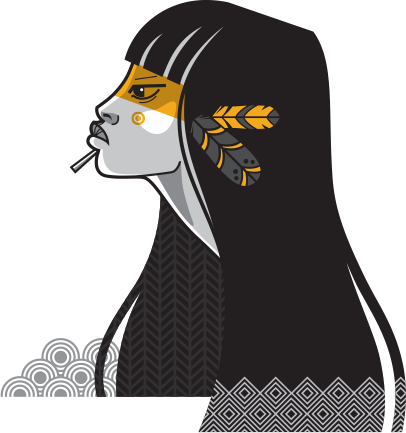 At the center of the debate is a girl named Hakani, a member of the Suruwaha Indian tribe, who has been adopted by evangelical missionaries Marcia and Edson Suzuki. The Suzukis say Hakani was rescued by an older brother, who carried the girl out of the jungle on his back. When they first saw Hakani, they say, she was 5 years old but weighed only 15 pounds and had scars all over her body. Eight years later, Hakani is walking and talking normally. Doctors say she had treatable thyroid problems. The Suzukis have hospital records and pictures of how the girl looked when they found her. They admit there is no way to verify what they say happened with the remote jungle tribe. They teamed up with American film director David Cunningham, whose father founded Youth With a Mission, to make a movie titled “Hakani” that graphically recreates Hakani’s alleged attempted murder. It is being shown on the Internet and at churches in the United States and Brazil to raise money and awareness of legislation against infanticide in the Brazilian legislature. The missionaries say Hakani’s story is not an isolated case. They say infanticide is common among Brazil’s more than 200 indigenous tribes, which they say sometimes kill babies because they are deformed or are born to a single mother. The missionaries say the Brazilian government often overlooks the killings in the name of respecting Indian culture. The Brazilian government has tried to discourage infanticide, but the Department of Indian Affairs does not have a policy that requires action to stop it from happening. The state, he says, should not use the moral judgments of modern culture “to regulate the indigenous cultures who have survived in this land a lot longer than us whites.” To do so, he says, risks subverting ancient cultures. It is a view shared by some activists. Critics say the missionaries’ claim of 200 baby killings a year is seriously overstating the problem. “Infanticide is quite rare and it’s dying out,” Watson said. For the missionaries, “this is part of a strategy to justify their presence on indigenous lands,” Vaz said. He and activists like Watson are particularly offended by the “Hakani” movie, which they call racist. “Community actions are taken out of the cultural context and portray the Indians as savages, barbarians,” he said. At a time when Brazil’s Indian tribes are being forced off their land or killed by ranchers, miners and loggers, Watson says the infanticide issue is a destructive distraction. She argues, in fact, that evangelical missionaries have emerged as perhaps the greatest threat to the Indians’ survival. Watson says that when the Indians’ traditional faiths are erased, it destroys their cultures, which have remained self-sufficient for hundreds if not thousands of years. Vaz recently completed an investigation into Youth With a Mission. His report accuses the group of “hiding their intent to evangelize” and bribing tribe members with tools and medicine to get them to listen to the gospel. The report, without elaboration, accuses the missionaries of slavery, illegally taking blood samples from Indians and illegally removing Indian children from their homes. Braulia Ribeira, who runs the group’s operations in the Amazon, denies the allegations. “I think they threw as many accusations as they could, hoping that at least one of them would stick,” she said. 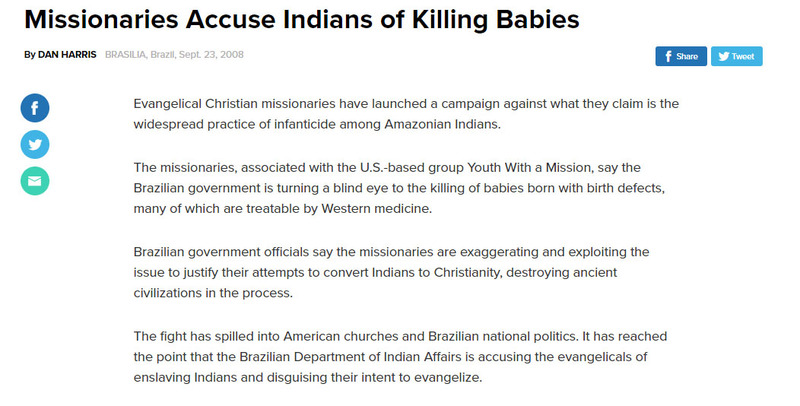 The missionaries deny that they are using infanticide as a smoke screen for efforts to convert Indians. Group members, including Marcia and Edson Suzuki, often live with tribes for decades, learning their ancient languages and providing health care and education. Despite their religious orientation, Ribeira says, they do not proselytize. However, at one site where the group is working, deep in the jungle near Porto Velho, an Indian girl wears a Jesus T-shirt. Francisca Irving, one of the missionaries working there, freely admits to preaching the gospel to Indians. The legislative push against infanticide is gaining steam in the Brazilian legislature. One house of the Brazilian legislature has passed a bill to allow children whose lives are “at risk due to cultural practices” to be removed from their homes. Meanwhile, Vaz says the Department of Indian Affairs is developing a policy.